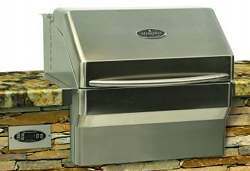 Memphis pellet grills, made by Hearthland Products LLC, are built in stainless steel, including the grill grates, (except for the Advantage model where they're nickel plated). All Memphis pellet grills use Intelligent Temperature Control which is a digital system that checks temperature every two seconds. A food probe can be used on all Memphis grills, (standard on the Memphis Pro, optional on the Advantage and Select). When the required temperature is reached, the grill will automatically drop back to the warming temperature. 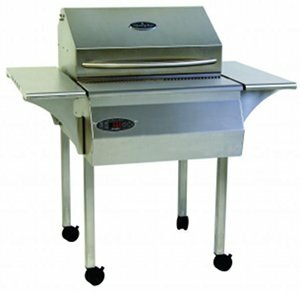 The Memphis Pro is built in stainless steel, including the grill grates, and has a double hopper for the pellets to let you blend the cooking flavour. The cooking area is insulated to avoid heat loss, increase fuel economy, and reduce temperature fluctuations. A programmable food probe is standard equipment on this model, which has a double fan system for even heat distribution. Built in the cabinet style, there is a closed storage area underneath on the freestanding model. Here's the Memphis Pro built into a garden wall. 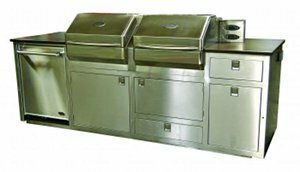 Dimensions H 47" W 57" D 29"
The Memphis Advantage is built in stainless steel, including the grill grates. A programmable food probe is an optional extra on this model. Dimensions H 47" W 45" D 29"
Temperature control Digital one-touch temperature control checks and adjusts heat ever two seconds. 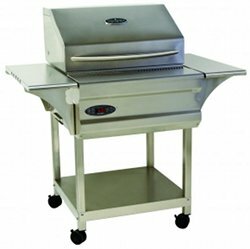 The Memphis Select is built in stainless steel, the grill grates are nickel plated. 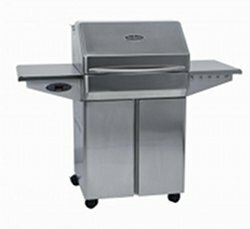 A programmable food probe is an optional extra on these Memphis pellet grills. The hood liner is insulated. Dimensions H 46" W 31" D 26"
Here's a five minute video explaining the functions of the Memphis Pro.